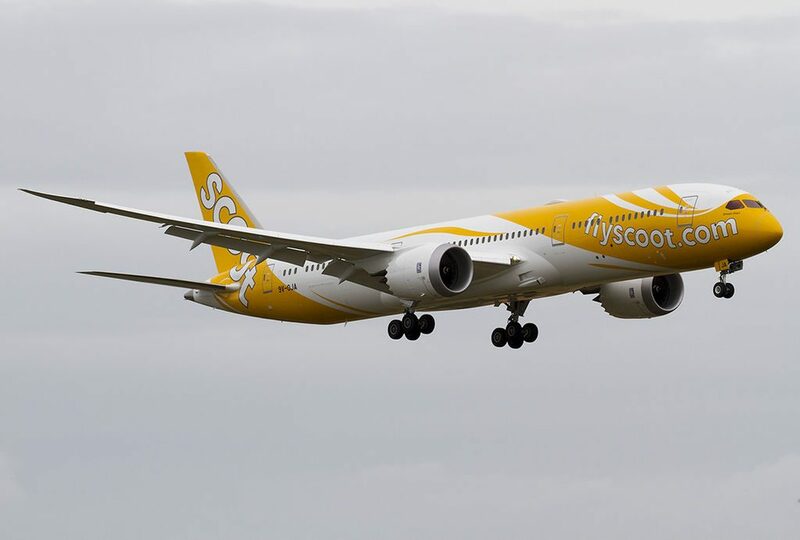 Scoot Airlines Fleet Boeing 787-9 Dreamliner Details and Pictures. 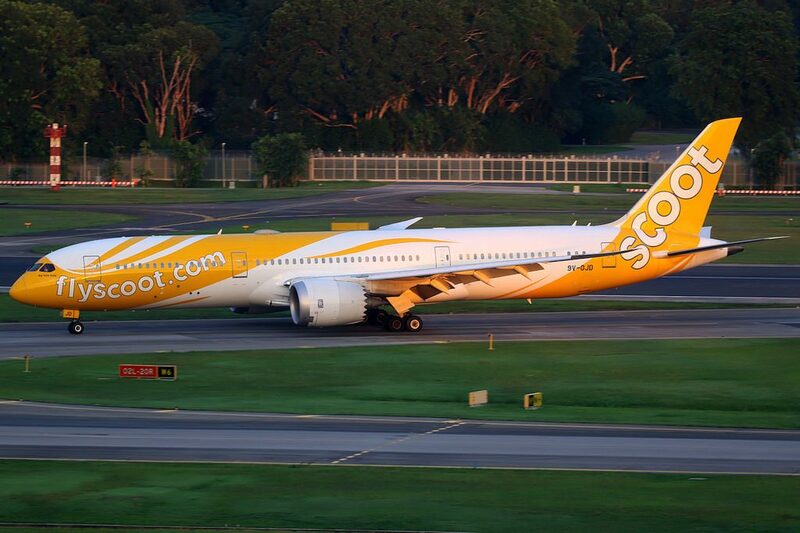 Singapore low cost carrier Scoot Airlines operates 8 wide-body aircraft Boeing 787-9 Dreamliner. 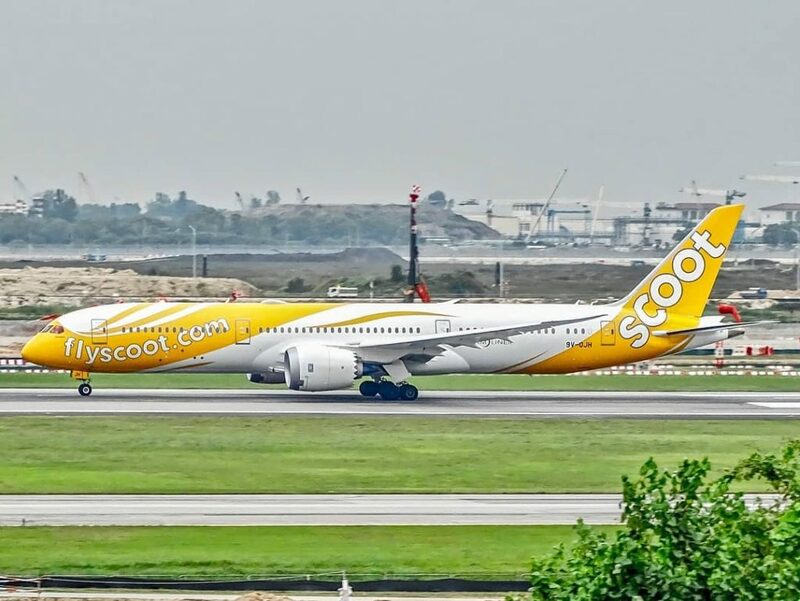 Before adding Airbus A320 family (A319, A320, and A320neo) tho their fleet, Scoot Airlines operate an entire fleet consisting only of brand new Boeing 787 Dreamliners. 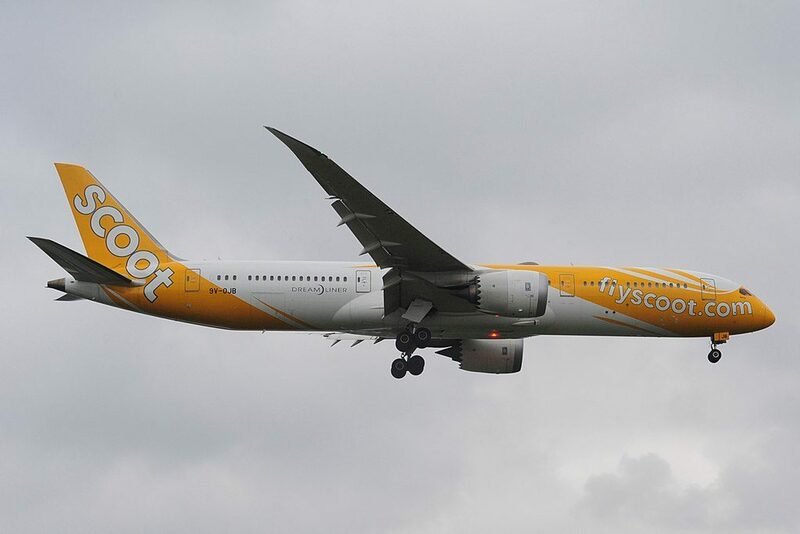 Keeping the same wingspan as the 787-8, the 787-9 is a lengthened and strengthened variant with a 20 feet (6.1 m) longer fuselage and a 54,500 pounds (24,700 kg) higher maximum take-off weight (MTOW), seating 280 passengers in a typical three-class arrangement over a 7,635 nautical miles (8,786 mi; 14,140 km) range. It features active boundary-layer control on the tail surfaces, reducing drag. The seating in the Economy Class cabin features a 31-inch seat pitch and seat recline of 6 inch making it the greatest recline of any low cost carrier operating in the Asia Pacific area. 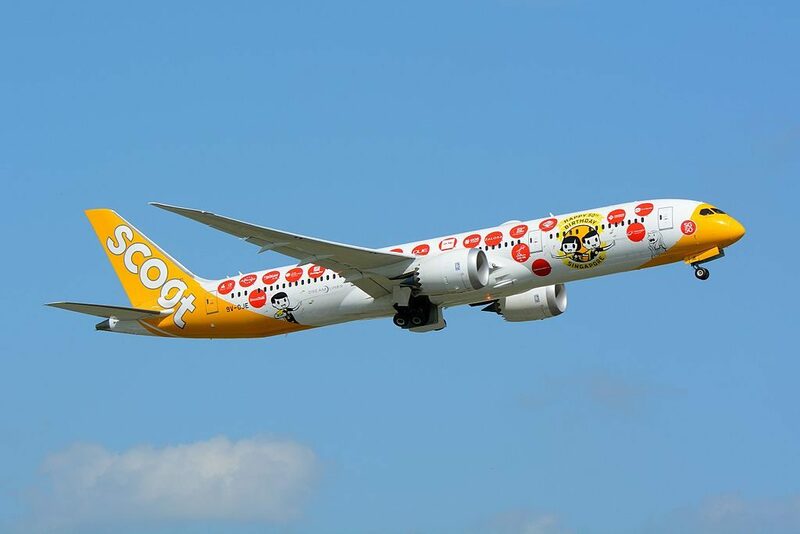 The Scoot-in-Silence cabin ( where no children under 12 are permitted) is retained on the Dreamliner however, unlike on the old 777, there is no curtain, just a bulk head separating it from Economy Class. This cabin with its extra legroom (seats have a 35 inch pitch) is genius and sales prove that it is popular with the travelling public. I did have one concern on the Dreamliner however. 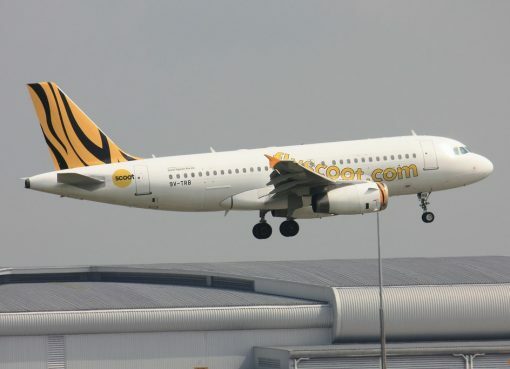 There is a large area of space between the Scoot-in-Silence cabin and Economy where people can have a stretch. It’s also the perfect area for parents to pace back and forth with their upset babies and passengers in the quiet cabin did mention this on the return flight. 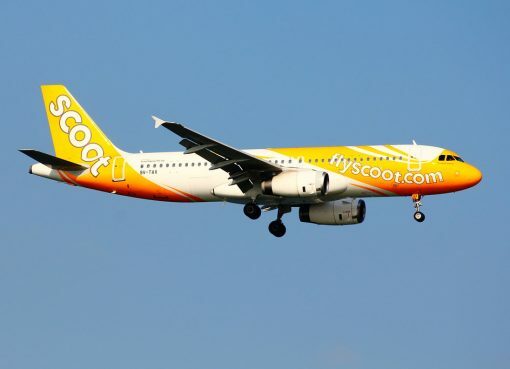 Both Economy and Scoot-in-Silence cabins have in seat power but you need to pay $8 Singapore dollars to use it. 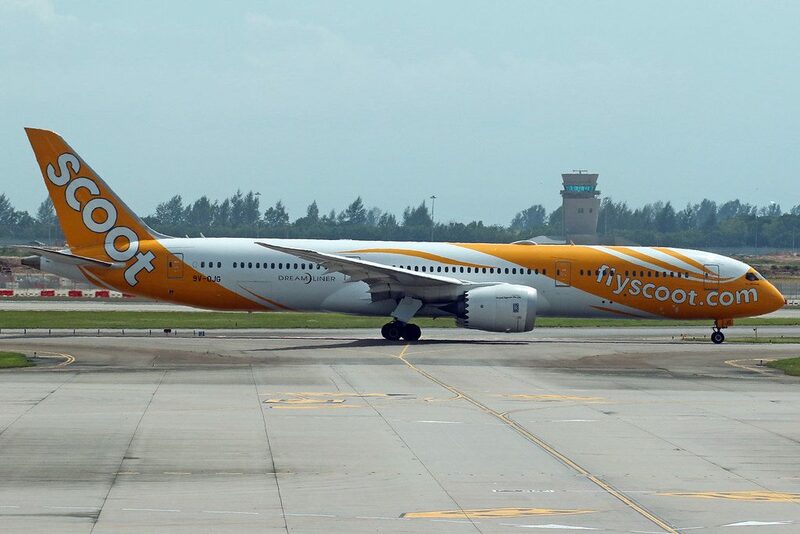 At first I thought this was a little cheeky, but the reality is that this is a low cost carrier that offers one way fares as low as $129 Australian dollars and the options are there for a reason. If you want more comfort and entertainment, then you pay for it, otherwise, enjoy your cheap fare, be organised and power up your device first. 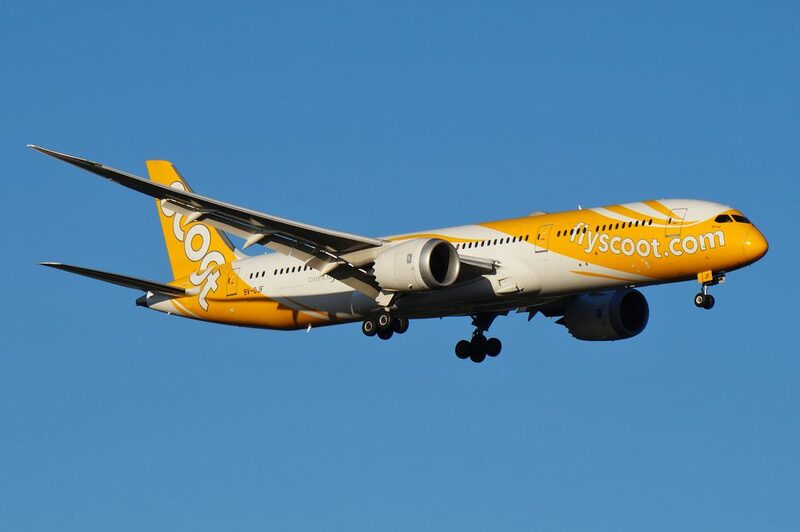 Scoot Business Class or “Scoot Biz” as it’s called, is not your typical Business Class, it’s more of a no frills Premium Economy and it’s at this point that you need to remember you only paid $400-$500 for this “Business Class” not $2,000 and keep your expectations in line. The seats, covered in a black leather have a 38 inch seat pitch, 8 inch recline and come with complimentary in seat power, in flight entertainment (to be streamed to your own device), and an extendable leg rest. 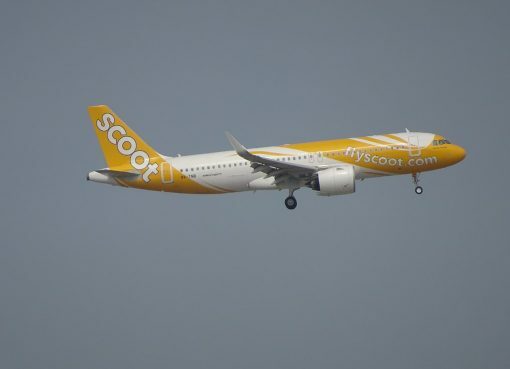 First 5 rows of seats represent seats of business class designated by Scoot Airlines as ScootBiz seats. These seats have 2-3-2 configuration and have 22 inches width. All these seats are standard, only the seats of the 1st row have such disadvantage as lack of floor storage during take-off and landing. Behind the seats of business class 5 rows of Scootin Silence type seats are located. These seats are located in a quiet zone. An extra fee must be paid to book these seats. Passengers under 12 years old cannot choose these seats. Passengers of the seats of the 6th row will take advantage of extra space for their legs. However, as the tray tables are built-in the armrests the width of these seats is reduced a little and these seats have no floor storage during take-off and landing. Economy class may accommodate 295 seats. Most of these seats have 3-3-3 configuration. 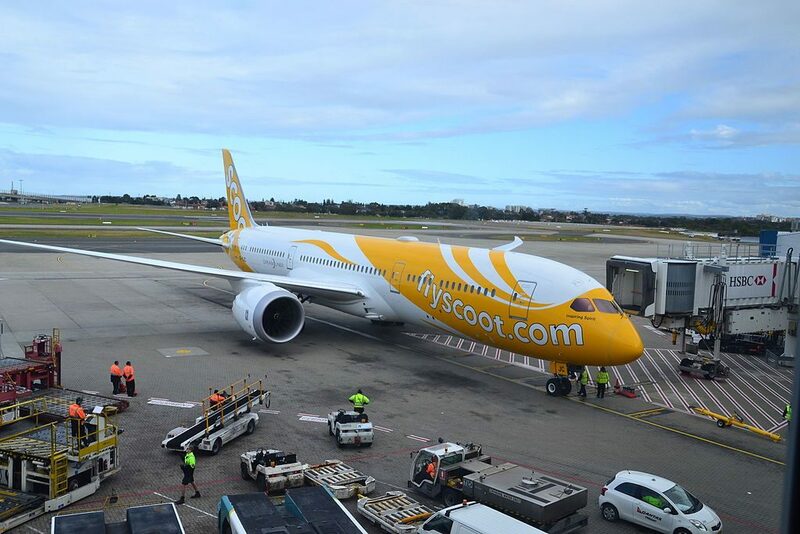 Scoot Airlines designates the seats of the 11th row as S-t-r-e-t-c-h Seat. An extra fee must be paid to reserve these seats. These seats offer extra legroom. Among disadvantages: galley located in front, slightly reduced width and lack of floor storage during take-off and landing. DEF seats of the rows 11-14 are designated as SuperSeat to book which extra charge should be paid. Close location of the lavatories will cause discomfort to passengers of the seats 28C, 28DEF, 28HJK and 29 ABC. Missing window makes the seat 29A bad seat. Behind the exit row second section of economy class seats is located. Thanks to exit row located in front the seats 30DEF, 31ABC and 31HJK have extra legroom. These seats are designated as S-t-r-e-t-c-h Seats to choose which extra fee must be paid. But noise from the lavatories located in front, reduced width and lack of floor storage during take-off and landing may cause discomfort to passengers of these seats. Extra fee must be also paid to reserve ABC and HJK seats of the rows 32-33because these seats are designated by Scoot Airlines as SuperSeats. Because of missing windows the seats 42A and 42K are considered bad seats. The seats 44AC and 44HK are designated as SuperSeats that may be reserved for additional charge. These seats are ideal for passengers travelling with a partner. Thanks to missing middle seats passengers will be able to take advantage of more space. However, these seats may not recline and are located close to lavatories. Proximity of lavatories is the only disadvantage of the seats 44D and 44F. The seats 45DEF are less reclining than standard and are located close to the galley and lavatories what makes these seats bad seats. AC Power. All seats feature an AC power port. Internet. Wi-Fi is complimentary for Business Class passengers and available for purchase by Economy Class passengers. Click here for more information. Food. Food and beverages is available for purchase on board, with options ranging from finger foods to full gourmet meals. Click here for more information. 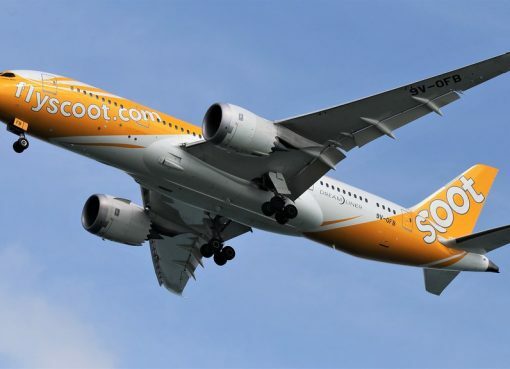 Thanks to visiting AirlinesFleet.com and read article : Scoot Airlines Fleet Boeing 787-9 Dreamliner Details and Pictures.